Pyramids of Bosnia: Stecak or cosmic disc? 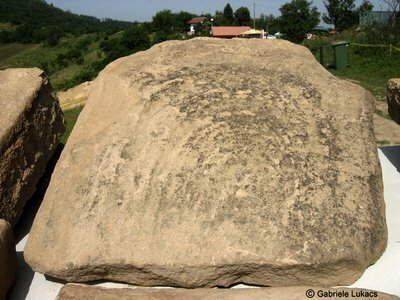 April 24th, 2006 A broken stone was found on the plateau of Visocica hill by G.Lukacs. It does not look like a stecak but rather like a drawing of planetary orbits with a hole for the sun in the middle. The stecci (singular: stecak), the monumental medieval tombstones that lie scattered across the landscape of Bosnia-Herzegovina are the country’s most legendary symbol. Although a few are found in Croatia and Montenegro, the vast majority are found within the borders of Bosnia-Herzegovina – 60,000 in all, of which approximately 10,000 are decorated (and sometimes inscribed). Appearing in the 12th century, the stecci reached their peak in the late 14th to 15th centuries, before dying away during the Ottoman occupation. it seems unlikely that this artifact represents the planetary orbits. the shape of the 'orbits' is all wrong (neither circular or eliptical, but rather an elongated pill shape). if someone is going to make the argument that a civilization is advanced enough to envision the orbits or the planets "with the sun in the middle", then it follows that the artisans would undrstand the eliptical orbits of those planets. however, i remain intrigued by the concept of a stepped pyramid existing in bosnia, and i look forward to more developments.